Glenn Irwin on the PBM Be Wiser Ducati at Brands Hatch. Glenn Irwin ended his rookie season in the MCE British Superbike Championship on a high by chalking up his second rostrum finish on the PBM Be Wiser Ducati at Brands Hatch. Irwin’s team-mate, Shane ‘Shakey’ Byrne, sealed an unprecedented fifth BSB crown on Sunday on a terrific day for Paul Bird’s team. Carrickfergus man Irwin finished third in tricky conditions in race one at Brands on Saturday and it seems the Ulster prospect has impressed team boss Bird enough this year to keep his place in the team for 2017, with the Cumbrian entrepreneur saying he was unlikely to change his line-up after admitting he had been in talks with a number of World Superbike riders, including Italian Davide Giugliano. In wet conditions on Saturday, Irwin rode an impressive race to claim the final podium spot behind Christian Iddon on the Tyco BMW, with Peter Hickman winning the race on the JG Speedfit Kawasaki. Irwin, who along with Iddon is amongst the headline acts at the Sunflower Trophy meeting at Bishopscourt this weekend, said: “It was a really good race for me but just to get to the finish was very tricky as conditions were difficult. Irwin finished seventh and 17th in Sunday’s two races at the triple-header meeting, ending the championship in 12th overall. Michael Laverty was 11th in race one and 16th in the final two races on the Tyco BMW. The Toome man finished eighth in the points table ahead of team-mate Iddon. Alastair Seeley finished ninth, 12th and 13th respectively in the three races at Brands. 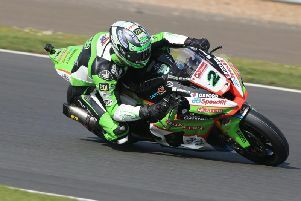 English rider Byrne put one hand on the title on Saturday when chief opponent Leon Haslam (JG Speedfit Kawasaki) was caught out by the conditions on the first lap in the delayed opener. Byrne then finished sixth in race two race behind Haslam, which was sufficient to seal the outcome with one race to go. Haslam did enough to clinch second in the Showdown from James Ellison and Honda’s Dan Linfoot. Ellison took the spoils in the third and final race of the 2016 MCE BSB season ahead of American John Hopkins (ePayMe Yamaha), with Byrne fittingly climbing onto the rostrum in third. In the Pirelli National Superstock 1000 race, Clogher man Keith Farmer maintained his superb form with a brilliant runner-up finish on the Quay Garage Honda behind veteran Michael Rutter (Bathams BMW). Farmer was third in the final standings after a renaissance in 2016. Ian Hutchinson finished third to cement second place in the championship, which was won by Buildbase BMW’s Taylor Mackenzie. Lisburn’s Carl Phillips also had a season to remember as he finished as the runner-up in the Superstock 600 class, taking third in Sunday’s decider to end the year only 13 points behind winner Jordan Weaving. Eugene McManus was 10th and sixth in the British Motostar races with Richard Kerr claiming fifth place in race one. Eglinton rider David Allingham finished fourth in the Dickies British Supersport Sprint race, while Andrew Irwin was 12th and sixth on the Gearlink Kawasaki. Scotland’s Tarran Mackenzie won the championship by 46 points from James Westmoreland. Meanwhile, Michael Dunlop proved his versatility with a brilliant ride in the second British Sidecar race at Brands Hatch. Dunlop and passenger Dan Sayle finished fifth overall in the wet at the Kent circuit. Thirteen-time TT winner Dunlop has previously stated his desire to compete in the Sidecar class in the future on the Mountain Course.